While Bruce Wayne typically has a very strict 'no guns, no killing' rule, the opposite is true for Tony Stark. The armored avenger has appeared in six Marvel Cinematic Universe movies (including Captain America: Civil War), and as this supercut by Youtuber Mr Sunday Movies cleverly illustrates he's racked up quite the kill count. 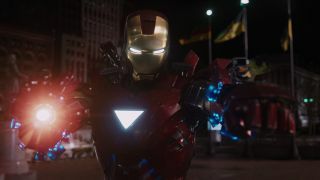 It's interesting to watch this video post-Civil War; the Iron Man we see in that film feels very guilty about all the collateral damage he and his fellow Avengers have caused, and this supercut gives Tony's new viewpoint some perspective. Directed by Joe Russo and Anthony Russo, and starring Chris Evans, Robert Downey, Jr., Scarlett Johansson, Chadwick Boseman, Tom Holland, Anthony Mackie, and Sebastian Stan, Captain America: Civil War is playing in cinemas now.